Freudenberg is a name synonymous with the manufacture and supply of the very finest products worldwide. Freudenberg, established in 1849, is one of the largest family owned companies in Europe with diverse interests from the manufacture of non-woven materials, various types of seals, medical equipment, chemicals, information technology services. Freudenberg is at the forefront of innovation in these various fields. Freudenberg Filtration Technologies (Pty) Ltd South Africa is located in Johannesburg with offices in Durban and Cape Town and representation throughout Sub-Saharan Africa. Our site includes full manufacturing and converting facilities. We carry a comprehensive range of products, which are made to stringent international quality specifications. These are supplied to the leading manufacturers in the relevant markets. We have full support of FFT Germany in terms of test facilities / test rigs, laboratory and application engineering. Freudenberg Filtration Technologies has a reputation for delivering the very finest in air filtration technical expertise and service. A comprehensive range of standardized air filtration products is offered for use in a host of applications in general industry; covering Mining, Automotive, Petro- Chemical, Power generation, Iron & Steel as well as Air- conditioning. From the supply of a single filter mat, to the design, manufacture, installation & commissioning of entire air filtration plants, for the removal of dusts or harmful gasses. This has resulted in numerous unique product families, comprising Dust Control, Ventilation and Gas Phase filtration – all of which are made to stringent international quality specifications. The latest corner stone was achieving the Eurovent certification for air filters, which only a few filter manufacturers have obtained worldwide. Eurovent, is an idependent organization for the certification of components that go into air handling units has established a new programme for the certification of fine dust air filters in the filter classes F5 to F9. The aim of the programme is to ensure that the customers are getting what they are paying for. Every year, filters from the certified manufacturer are randomly checked and the measured data is compared with the published data sheets. The Eurovent certificate is only issued if the test results obtained match the data published by the manufacturer. Freudenberg Filtration Technologies was amongst the first three suppliers worldwide to have obtained the Eurovent certificate. Freudenberg Filtration Technologies (Pty) Ltd South Africa is a leading manufacturer and supplier of industrial filtration products, engineering solutions and with a client base spanning South Africa and beyond. The Ford Motor Company has recognized the work of Freudenberg Filtration Technologies in Potvorice with its prestigious Q1 Award for suppliers. Freudenberg’s Slovakia facility manufactures high-quality micronAir cabin air filters. Studies show that the smallest particles in the unfiltered air we breathe harm our health. Fine dust with a particle size smaller than 10 micrometers (PM10) reaches the upper part of the respiratory tract. Dust smaller than 2.5 microns (PM2.5) penetrates into the bronchi and below 1 micron it reaches the central region of the lung. Viledon filter mats are progressive in structure, i.e. the density of the fibre layers increases towards the clean air side, thus achieving optimised defined filter performance and dust holding capacity at a low pressure drop. This optimizes the defined filter performance and the dust holding capacity, resulting in longer useful lifetime for the filter concerned. All filter mats are manufactured using an eco-friendly recipe. Freudenberg Filtration Technologies offers a range of panel filters. They can be used as a pre-filter for a second filtration stage or as a main filter where coarse-dust filtration is sufficient. The filter media is foamed into the frame thus ensuring that the filter is leak-free and robust. Both, self-supported and wire mesh supported versions are available. All components are non-corrosive, which makes the filter 100% moisture-resistant and fully washable. Viledon pocket filters are designed for toughest environmental conditions due to their mechanical stability and high dust holding capacity/long lifetime. The features are: leak-free welded filter pockets foam-sealed into the front frame, progressive structure of the filter media, inherent rigidity of the filter pockets and aerodynamic design. They are non-corroding, moisture-resistant up to 100% relative humidity, thermally stable up to 70°C. The high dust loading capacity and stability of the MaxiPleat filters ensure long service lifetimes and maximum operational reliability. Using a special pleating and embossing technology filter medium keeps itself spaced thus allowing for an aerodynamic pleat geometry and result in optimized flow conditions with low pressure drops even at high air flows. The filter elements are lightweight, corrosion-free and moisture-resistant up to 100% rel. humidity and come in the filter classes F6 to H12. 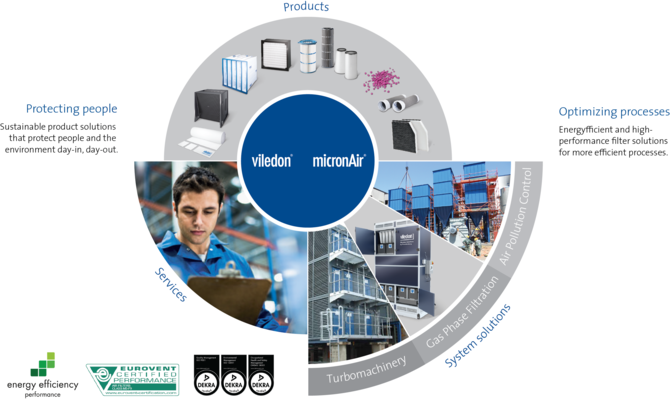 Viledon High Efficiency Particulate Air (HEPA) filters are available in filter classes H10 to U17. From Filter Class H13, quality is assured by individual testing of each filter using an oil-thread or a leading-edge scan test rig. They are available in numerous different versions, corrosion-proof, easy to install, and eco-compatible to dispose of. Freudenberg Filtration Technologies has been designing, manufacturing, and supplying air intakes for turbo-machines for many years. Our layout is based on the atmospheric conditions on site, which we analyze carefully before doing a layout. Our Viledon compact pocket filters, MX cassette filters and gas turbine cartridges were specifically designed for the use in turbo-machines and offer high-performance protection of rotating equipment and intercoolers. Filter cartridges ensure efficient dust removal thanks to their construction details and the availability in all the geometries and versions customarily demanded by the market. Freudenberg is your one-stop source in emission control. From the manufacturing of the filter elements through to the design, manufacture, installation and commissioning of complete dust removal units, we have all the know-how required to meet the requirements of your application. This also includes the retrofitting of existing dust plants with Viledon filter cartridges to optimize the performance, the refurbishment of old units, and the supply of spare parts. Thanks to the Evolon technology NEXX filter bags are the next generation of surface filters with outstanding advantages over traditional filters manufactured from needled felt. This high-quality patented filter medium possesses unique properties for surface filtration. Excellent in water and oil repellence, with long filtration cycles and long service life. Thanks to optimized filter performance reduced energy costs.